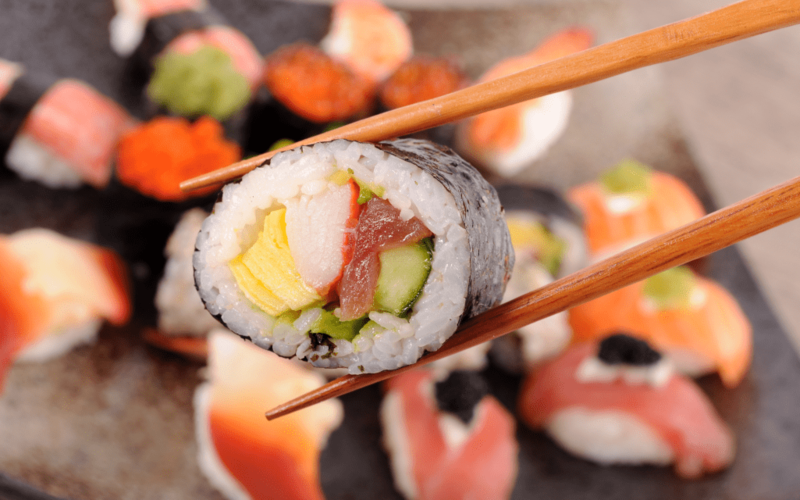 Sushi is a healthy, low-calorie food because, traditionally, it is only made of fish, rice, and vegetables but since it’s become popular outside of Japan, a lot of unhealthy sushi recipes have been developed. So, it is important to learn how to choose which sushi is good for you, especially if you are trying to lose weight. Tuna or Salmon Sashimi. Tuna and salmon are rich in Omega-3 fatty acids which are needed for a healthy heart and skin. Moreover, sashimi is sushi served with no rice, so the calories are really low; therefore, it is perfect if you are really watching your calorie intake. Also, make sure to eat it with wasabi to help kill any bacteria. Rainbow Roll. This sushi is a vegetable roll that has fish wrapped around it so, you are not only getting vitamins but also some Omega-3. You can make a high-fiber version if you choose brown rice instead of white rice. Avocado Roll. Avocado roll is one of the sushi rolls that are super low in calories, so this is really a great option if you are trying to shed off some pounds. In addition, avocado is high in mono-unsaturated fats which are needed for a healthy heart. Tuna Roll. Tuna is high in protein, so this is the perfect meal if you are on a high protein diet. Make it healthier by choosing to order a brown rice version from your local sushi bar. Cucumber Roll. This is a pretty straightforward, low-calorie sushi roll because it’s only made of three ingredients – rice, nori, and cucumbers. Not only is this low calorie but also, very refreshing because of the cucumbers. It is one of the easiest sushi recipes you can make at home. If you really want to lose weight, it is important to skip sauces that have mayonnaise when ordering sushi and as much as possible, choose a version that uses brown rice so that it’s high in fiber. You may also opt for a low-sodium version for your soy dipping sauce. Never order crispy sushi because that has been deep fried, making it high in fat. Rana Tarakji is an entrepreneur and a contributing writer at OneSEO (http://oneseo.net/blog) who lives in Beirut, Lebanon. Rana Tarakji is passionate about digital marketing, startups, helping entrepreneurs grow, and empowering them to live their dreams. She has worked as a digital marketer, a technology co-founder and business developer, and a writer.